Successfully Added Media Player External Enclosure For 2.5 Inch IDE + SD MMC Slot to your Shopping Cart. Smart Media-Playing IDE 2.5 Inch Portable Hard Drive Enclosure with a SD/MMC memory card reader. 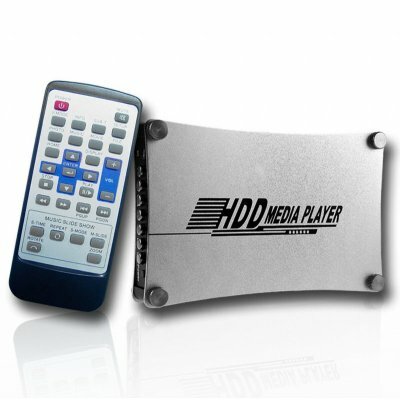 This inexpensive alternative for mass storage and playing of digital media will natively play MPEG1/2/4, DIVX3.X-5.X, AVI, ASF, VOB, DAT, MP4 MPG, as well as JPEG, BMP, and GIF pictures and MP3 music with .lrc lyrics. As well VGA, RCA, and even S-Video input will make displaying you digital media on many different screens easy and fast. Make your digital files play anywhere you want with this high end HDD Portable Media Player direct from China. using the composite cable for sound was not a problem,crystal clear,however when using the composite to get a picture i was disapointed,very bad.navigating the players menu was a little slow and plodding but functional and very easy to understand. i am taking 2 stars of this for the bad composite video connection and the stuttering movies.